Dr. L. Stafford Betty is not your stereotypical religion professor. He has an open mind, is interested in Truth, and dares to examine academically taboo subjects like mediumship, near-death experiences, past-life studies, death-bed visions, and, most importantly, the subject they all lead to, life after death. Betty earned his BS in Math and English at Spring Hill College (1964), his MA in English from the University of Detroit (1966) and his Ph.D. in Theology from Fordham University (1975). I recently put some questions to him. Professor Betty, what prompted you to write about the afterlife? “As a teacher I enjoy making people aware of the important facts of their existence, especially when the facts are positive and tend to produce happiness. There are few facts more positive, both for me and most people I know, than our surviving death, followed by a positive afterlife experience. This is good news indeed, and I wrote my book to share it with the reader. This was my primary motivation. “But there was a second reason. I look around me and see a society – especially our youth – lacking a sense of purpose. ‘Just drifting’ is a good word to describe countless Americans. It doesn’t occur to them that the correct question to ask themselves is not ‘What can I get out of life?’ but ‘What does life demand from me? What can I give to life?’ The habit of giving doesn’t come easy. To become a giver, you need special incentive. A single-life perspective supplies no such incentive. Instead it seduces us into thinking that we’d better get all we can now because this is the only chance we’ll ever get. Postpone gratification? Why should we? Lie and cheat to get ahead? Why not, since there is no cosmic accountability? What’s to stop us as long as we take care not to get caught? So we become hedonistic, sometimes ruthless selfniks. How does what you write about the afterlife differ from that of orthodox religions? “I scan the various afterlife beliefs – from the Ten Hells of the Chinese Yama Kings to the interrogation in the tomb by Islam’s angels of death to the Buddhist descriptions of paradise in Amida’s Pure Land – and know I am reading mythology. At the literal level they are implausible. But as metaphors they serve a useful purpose. They tell believers they are accountable for their actions; they are the carrot and the stick that inspire and goad them to virtuous action. “But they sound like what they in fact are: works of imagination by men who have not been to the places they dare to describe. We are looking for something more reasonable, more just, more attractive, more bracing, more challenging – a place or environment where life is lived more intensely and freely, with our better angels in the vanguard, but where progress does not come cheap. The Hell of conventional Christianity makes a monster of God, while the usual depiction of Heaven is either vague or medieval—not the sort of place most of us would like to spend more than a day or two. Why do you think orthodox religions are so opposed to accepting the teachings that we get from mediumship, near-death experiences, past-life studies, and other phenomena? Will you use the book in any of your classes? I know you were using Helen Greaves’ Testimony of Light, which is the subject of Chapter 6 in your book, in your classes at one time. Do you still use it? If so, what has been the general reaction of your student to the messages? Do you get a lot of resistance from the university administration or colleagues for your unorthodox teachings? As I recall, your “Meaning of Death” class was fairly popular among students several years ago. Is it still popular? In a nutshell, what is the “Meaning of Death” as you understand it? “I’ve thought a lot about this question but will try to keep it short. I believe death was created by the Source (God, if you will) as a means, perhaps the very best means, of bringing forth noble character in us. “Let’s begin with an analogy. What do we most want for our child? Good looks, smarts, popularity, wealth, power, fun, happiness? Nothing wrong with these, but are they what we most want? Not if we are wise. What we most want, or should want, is noble character, virtuous habits, plain old goodness. Another way to put it: What do we most admire in others? The answer would be, or should be, the same. Accordingly, what would God want in us, his earthly children? The same. “But nobility of character does not come cheap. Unless morally challenged, we don’t grow – just as spoiled children don’t mature. So He (sorry) challenges us continually. And we experiment: We learn what works and what doesn’t, what brings us praise and what brings us censure, what counts as sensitivity and what counts as cruelty, what keeps us alive and what can kill us. God has designed our world to be a moral gymnasium. We are souls in training. Some athletes prefer to play teams they can beat, but others want stiffer competition. If we are wise, we will not wilt under the pressure of the ‘stiffer competition’ – the rejection by the one we love, the being passed over at work, the cancer that has become a death sentence – but will fight on. Trusting in God, we will bear in mind that the greater the suffering, the greater the potential for growth. God has given us a world full of physical danger and moral challenge lived out under the constant threat of death, and He hopes that we will use our freedom to choose the good over the bad, and do it habitually, in spite of tremendous temptation to capitulate and give up. To do so is to bring value, excellence, and ultimately joy into the universe, and that is what God wants. It’s what we should want too. “The Protestant philosopher John Hick, whose masterly book Evil and the God of Love is our generation’s best expression of this point of view, wrote: ‘It would seem, then, that an environment intended to make possible the growth in free beings of the finest characteristics of personal life must have a good deal in common with our present world.’ And that would include death. Many of the people who have read my book, The Articulate Dead, and other books reporting on some of the great mediums of the past, such as Leonora Piper, Gladys Osborne Leonard, Eileen Garrett, and Estelle Roberts are inclined to be skeptical of the abilities of those mediums of yesteryear. They wonder why, if they were genuine, we don’t hear of such mediums today. Sure, there are clairvoyants and clairaudients demonstrating on TV, but their abilities seem very limited when compared with the trance-voice mediums like Piper, Leonard, Garrett, and Roberts. With the clairvoyants, we get a word or two or an acknowledgement of some kind passed on to the sitter from the spirit world by the clairvoyant, but with the trance voice mediums we get actual dialogue, sometimes in the voice of the deceased, or at least in a voice resembling that of the deceased. Not to take anything away from the clairvoyants, but, generally, the trance-voice and the direct-voice forms of mediumship are much more convincing than the clairvoyant/clairaudient type. There are two primary reasons, I believe, why we don’t hear much about trance mediums these days. For one, trance mediumship takes time to recognize and develop. A hundred years ago, before radio, television, and other distractions, people had more quiet time and therefore there was more opportunity for the person to be passive and for the ability to surface. A potential medium today might so wrapped up in watching American Idol or Dancing with the Stars that she never experiences the passive state required for the spirits to get through. A second reason has to do with the fact that around 1930, the nature of the research changed. It was more or less felt that the survival of consciousness issue had reached the point of diminishing returns or was at an impasse, and so it became necessary to go back and start building all over again. Psychical research changed to parapsychology and researchers became more interested in psi or ESP, the building blocks leading to the survival issue. Interest in mediumship waned and research in this area became almost non-existent. Thus, while there were still trance voice mediums around, we didn’t hear about them because researchers didn’t observe them or report on them as they did with those famous names of the late 19th and early 20th Century. The parapsychologists are still working with the building blocks and the few scientists who have returned to studying mediums have focused on the clairvoyants, since they seem to be more abundant. In an impromptu home circle with a neighbor and the neighbor’s visiting sister, Suzanne concentrated on breathing, allowing herself t relax into a light altered state as she had done each morning in meditation. “I felt the familiar swirliness of a presence blending with my energy, but the sensations in my head were accompanied by an unfamiliar fullness in my vocal cords,” Suzanne recalls that first experience as a trance-voice medium. She heard the command “Speak!” but didn’t know what she was supposed to speak about. The urge was so strong that she just opened her mouth and a deep voice with a Russian accent said, “Good evening.” The voice was far deeper than her own and very masculine. As she wondered what next to say, a thought materialized in her mind. and words began to flow. “You must take a back seat tonight,” the voice transmitted. “For this we have been coming to you. For this time. To answer questions. To give you knowledge of our world….” Suzanne’s friends sat in awe of what was happening, not sure how to react. They put questions to the entity using Suzanne’s vocal cords and the voice responded. “As this male energy spoke through me, the left corner of my upper lip twitched several times without my consciously doing so,” Suzanne continued. “My head was drawn to a position 45 degrees to the left, held there as if by a magnet. The spirit answered several more questions then the pressure backed off and my head rocked slowly back and forth and from left to right.” Seconds later, she was drawn to the same position on her right side and a new voice came through. It was a woman’s voice, soft and sweet with a very proper accent. She gave her name as “Sally,” and also identified the male voice as “Boris,” but said that names mean nothing to those in the spirit world. They recognize each other by their personal vibration. “It is you humans who need to put a label on everything, and so we give you these names as a convenience,” Sally explained. The three women sat again three days later and the spirits came through again. “We have sat weekly ever since, and the transmissions have gone from stilted and slow to what is shown on the videos. In another reading, Suzanne told her client that she sensed a man present and gave a description of him and his passing. However, the client did not recognize the man. “My lip was twitching like crazy – like it had never done, and my head was drawn to where I always sense Boris,” Suzanne continued. “I asked him what was going on. It turns out I had brought through a woman, not a man, and Boris had been trying to tell me that I was off track. When I told the client it was a woman and repeated the other evidence, she was able to identify who the spirit present with us was. Most psychologists would likely say it is all coming from Suzanne’s subconscious. The wisdom has all been stored away there over the years and is now surfacing when she is in an altered state. Of course, that doesn’t explain the evidential information that comes through. Some parapsychologists might say that Suzanne is telepathically reading the minds of the sitters. That was what many of the researchers of old said about mediums like Piper and Leonard. When information came through that was unknown to the sitter, they speculated that it is possible to read the minds of anyone in the world or to dip into some cosmic reservoir for information. Most of the pioneers of psychical research came to accept the spiritistic hypothesis, but there were a few holdouts and some parapsychologists today still subscribe to the subconscious explanation, even though they are unable to explain how an evidential word like lollapalooza can come through. As researcher Minot Savage once asked, why is the “secondary personality” pretending to be the spirit of some deceased person? What is its motive? What makes this secondary personality of so many people such a trickster? You can see another video below. When Stanford University researchers attempted to calculate the IQ of history’s greatest minds by applying the Terman Standard Intelligence Test to a massive database of historical material, only three people scored above 200 – Emanuel Swedenborg, Johann Wolfgang von Goethe, and John Stuart Mill. Below them were such luminaries as Pascal, Galileo, Descartes, Kant, Kovalevskaya, Darwin, and Mozart. If a survey were done today asking respondents to identify those luminaries of the past, it is likely that Swedenborg’s name would be one of the least recognizable, at least in the United States. So who was this great genius? And why isn’t he better remembered today? Born on January 29, 1688, Swedenborg was a Swedish scientist, mathematician, inventor, statesman, author, and mystic. He is credited with making significant discoveries in astronomy, anatomy, magnetism, mechanics, chemistry, and geology. He invented a one-person submarine and a glider, the latter after calculating the weight-to-size ratio required for a “machine to fly in the air.” He designed an improved ear-trumpet, an airtight stove, a machine gun, a mercurial air pump, various mining machineries, and contributed plans for Europe’s largest drydock in southern Sweden. Fluent in six languages and conversant in nine, including Hebrew, Arabic, Greek, and Latin, he was also an accomplished musician and horticulturist. 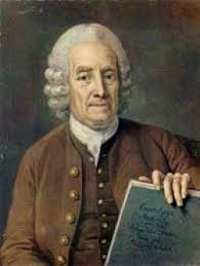 From about 1720 to 1745, he served on the national board that oversaw Sweden’s mining industry and published studies on metallurgy. And, he was an active member of Sweden’s House of Nobles. At the age of 55, Swedenborg had a series of clairvoyant visions, which, he said, gave him the ability to experience the spiritual dimensions. In one of his visions, he saw a temple with the words Nunc Licet over the door, which he interpreted to mean “Now it is permitted to enter with understanding into the mysteries of faith.” A year or so after these initial visions, Swedenborg abandoned all other pursuits and devoted his time to spiritual meditation and mediumistic trances during which he explored the spirit world. He claimed to have conversed with biblical prophets, apostles, Aristotle, Socrates, and Caesar, as well as with numerous deceased friends and acquaintances and spirits from other planets. Philosopher Immanuel Kant told the story of a fire in Stockholm which Swedenborg saw from 300 miles away in Gőteborg. While dining with others at the home of Mr. William Castel in Gőteborg, Swedenborg reported that a dangerous fire had just broken out in Stockholm and that it was spreading fast. He named a friend whose house had just burned and said that his own house was in danger. Two hours later, he said that the fire had been extinguished and extended to just two doors from his own house. All of the facts described by Swedenborg were later confirmed. Another story attesting to Swedenborg’s clairvoyance involved Louis de Marteville, the Netherlands’ ambassador to Sweden. Several months after Marteville’s death in 1760, his widow could not locate a receipt verifying payment of some valuable silver for which payment was being demanded by a goldsmith. Having heard of Swedenborg’s clairvoyant abilities, the widow asked him if he could communicate with her deceased husband and determine the whereabouts of the receipt. Three days later, Swedenborg called upon Madame Marteville, who had company at her house, and told her that he had spoken with her husband and that the receipt was in a bureau in the room upstairs. Madame Marteville responded by saying she had already searched that bureau. Swedenborg then told her of a secret compartment in the bureau as described by her late husband. Accompanied by her guests, Madame Marteville went to the bureau, found the secret compartment, of which she had been unaware, and there, too, found the receipt. Still another story involving Swedenborg’s clairvoyance, or clairaudience in this case, was reported by the Queen Dowager of Sweden, who decided to test Swedenborg by asking him what the last words of her deceased brother, the Prince Royal of Prussia, were to her. Some days later, Swedenborg returned, described the circumstances of the visit with her brother and then told her the exact words uttered by her brother. In fact, Kant verified all three stories by speaking personally with witnesses to them. Some years later, in 1770, Swedenborg was reportedly being honored at a dinner given by the manufacturer Bolander of Gothenburg. During the dinner, Swedenborg turned to Mr. Bolander and told him that he should go to his cloth mills right away. Bolander did so and upon arriving there found that a large piece of cloth had fallen near the furnace and was just beginning to burn. He concluded that if he had arrived just minutes later that his property would have been in ashes. Of the Adam and Eve story, Swedenborg reported that everything in the story is symbolic, Adam representing the intellectual side of man and Eve the emotional. The great Flood, he said, was not a physical deluge, but a flood of monstrous evils that overwhelmed the people in ancient times. Noah and his family represented those who had not succumbed to the immoralities of the time. Many other stories in the Old Testament, at least before Abraham, were similarly allegorical, Swedenborg was informed during his trances. Perhaps the most significant discovery by Swedenborg was the “world of spirits,” an intermediate region between the heaven and hell of Protestant theology, but unlike the purgatory of Catholicism, which was much like hell. The conditions of the spirit world that Swedenborg explored were very similar to earth, so similar that many newly arrived souls had to be told that they were no longer on the earth plane. It was in this world of spirits that newly arrived souls found themselves. Although modern Spiritualism did not begin to unfold until 1848, Swedenborg is sometimes referred to as the first Spiritualist. However, unlike many Spiritualists, Swedenborg did not think it wise for the average person to commune with spirits because of the risks involved in being negatively influenced by low-level spirits. “The only light that has ever been cast on the other life is in Swedenborg’s philosophy,” wrote Elizabeth Barrett Browning. Apparently, Swedenborg continued his work after his earthly death at age 84. William Stainton Moses, one of the best known mediums of the 19th Century, was informed by spirit communicators that Swedenborg and Benjamin Franklin, working together on the other side, figured out how to communicate with the earth realm by the taps, raps, and table tiltings that kicked off the Spiritualism epidemic in 1848. Swedenborg is said to have appeared to Andrew Jackson Davis, known as the “Poughkeepsie Seer,” and contributed to his enlightenment, and to have communicated with French researcher Allan Kardec. He further collaborated with Francis Bacon in communicating much about the afterlife through the mediumship of Dr. George T. Dexter during the early 1850s. Swedenborg’s writings are said to have influenced Goethe, Balzac, Coleridge, Carlyle, Lincoln, Tennyson, Emerson, Henry James, Oliver Wendell Holmes, Thoreau, both Brownings, Elizabeth Stuart Phelps, George Macdonald, and Helen Keller to name just some. A new abridged edition of the Swedenborg classic book Heaven & Hell edited by Simon Parke, is published by White Crow Books.